I think “The Nutella” definitely deserves a try. This reminds me of one of my favorite McDonald’s concoction back in college. 1) Buy an Apple Pie and a Hot Fudge Sundae. 2) Bite off one of the ends of the Apple Pie shell. 3) Pour contents of the Apple Pie shell into the Hot Fudge Sundae. Set aside shell for later use. 4) Mix Hot Fudge Sundae and Apple pie filling. I know you want to but don’t eat it yet. 5) I said DON’T EAT IT YET!!! 6) Pour back Hot Fudge Apple Pie Sundae mixture into the shell. 7) Now you can eat it. Enjoy! Do you have any “secret” menu items that you want to share? Feel free to post them in the comments section and I just might give them a try. 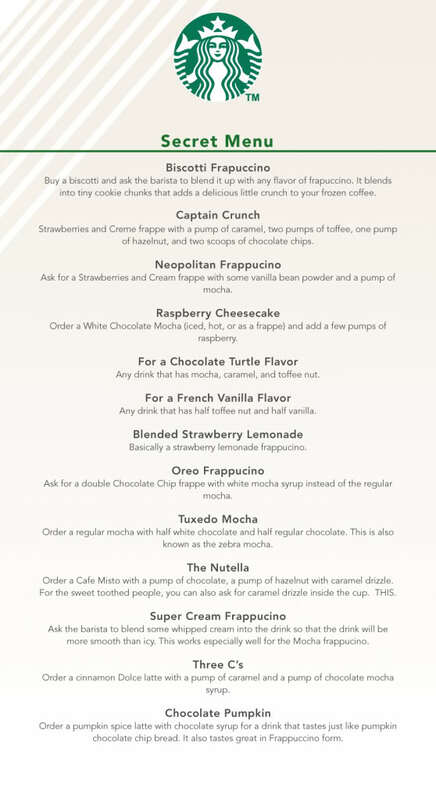 My sisters and I have actually tried ordering the Captain Crunch, though only during Christmas when the Christmas drinks are out because that’s the only time they toffee syrup. I used to order the Mocha Valencia Frappucinno but I guess it wasn’t selling so they phased it out. To get my Mocha Valencia fix now, I just order a Dark Mocha Frap and ask them to put a shot of orange syrup. Previous Previous post: You Are What You EATALY.